George John Hanggi of Ponca City passed away Thursday evening, January 4, 2018. He was 95 years old. Born December 6, 1922 in Little Rock Arkansas, he graduated Catholic High School as Valedictorian and then attended Arkansas Tech where he met his future bride Nina Sandlin. Following his induction into the Army, George and Nina were married on August 3, 1944 – just prior to his deployment to Europe. George served in the 16th Regiment of the 1st Infantry Division and fought in the Battle of the Hurtgen Forest, The Battle of the Bulge, then across Germany, the Hartz Mountains and into Czechoslovakia. He was wounded in Vettweiss Germany. He left the Army at the rank of Sergeant with a Purple Heart, three Bronze Stars, World War II Victory Medal, the Belgium Fourragere and the Combat Infantry Badge. After the war, George and Nina moved to Stillwater where he attended Oklahoma A & M, graduating with a Bachelor’s degree in Mechanical Engineering and a Master’s of Science. 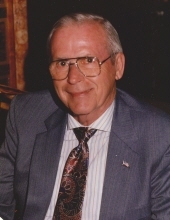 Moving to Ponca City in 1951, George was a Research Engineer for Conoco for 34 years before retiring in 1985, and began traveling the world with Nina. George was very active in the Boy Scout program serving as Cub Master and then Scoutmaster of Troop 5 at St. Mary’s Catholic Church. All three sons and three grandsons earned the rank of Eagle. George and Nina were very active in the Oklahoma Archaeological Society participating in many “digs” with the OU Archaeological College and was awarded the Golden Trowel for his contributions. He was a longtime member of the American Legion and participated in the annual Veteran’s Day Parade as well as a member of the VFW and the Society of the Big Red One, attending the annual Division Reunion. He was inducted as a DMOR (Distinguished Member of the Regiment) of the 16th Regiment for his service in both World War II and his community service in his civil life. George was preceded in death by his parents, Emil and Alma Hanggi, his brother Ray Hanggi, a newborn daughter, his son, Gerry Hanggi and daughter-in-law, Mary O’Meilia Hanggi. He is survived by his wife of 73 years, Nina of Ponca City, his son, John Hanggi and his wife Kristin of Marietta, GA; his son James and his wife Kris of Manassas Park, VA; five grandchildren, Jason, Michael and his wife Bailey; Susan; Tammy and David, step granddaughter Michele Harris and her husband Brent and their children Wesley and Reynolds, Nieces, Diann and husband Richard Nicolai, Becca and husband Brad Blaisdell, and Phyliss and husband Greg Heath. A rosary wake service will be held on Tuesday, January 9th at 6:00pm at Trout Funeral Home and a funeral mass will be held on Wednesday, January 10th at 10:00am at St. Mary’s Catholic Church in Ponca City. Burial will follow at St. Mary’s Catholic Cemetery. George will be available for viewing at Trout Funeral Home on Monday, January 8th until 8:00 p.m.
George will be remembered as a kind, gentle man of faith who enriched the lives of all he met.